Whether you are a complete beginner, junior, social, amateur or professional athlete; Block Athletics strives to improve your ability to run, sprint or jump. We offer group coaching sessions, focusing on basic technique and principles in a social environment; or individual sessions targeting specific goals. Block Athletics will work with you, your team or sports group on short or long term plans, to produce faster and more efficient athletes. 2019 - Celebrating 5 years of Block Athletics ... A big thank you to all of our past and present Block athletes and families for your support over the years. We were excited to realease our blue est.2014 training shirt range for current Block athletes as part of this milestone. *** LATEST NEWS *** 2019 INAUGURAL BLOCK GIFT . 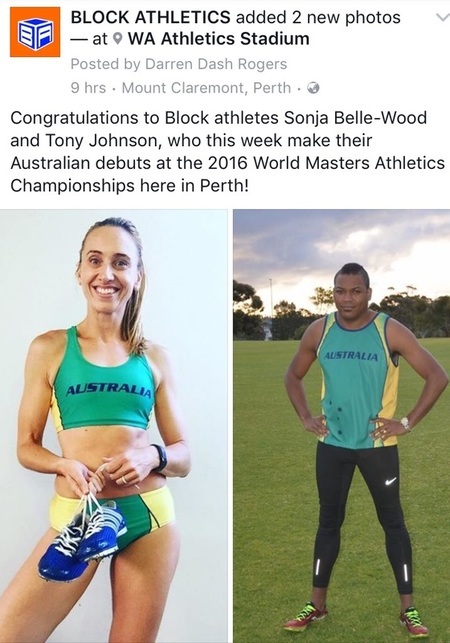 . .
​Block Athletes get into the Easter Stawell Gift spirit competing in Block Athletics very own Gift. Wearing traditional pro running lane colours; Red, white, blue, yellow, green and pink, 3 heats were tightly contested with the top two from each progressing to the final which was held under lights. The final was a close race, except for Chace who appeared to find some extra speed just in time to take out the Inaugural Block gift for 2019. Well done Chace on picking up your first Gift race sash as the front marker wearing pink. Congratulations to Elsie, Eva, Ethan, Imogen and Lara for all making this years final. Congratulations to our three 2019 W.A State Champions... Donovan rounded out our season of competition, joining Lachlan and Imogen with his title at the W.A Masters Athletics State Championships, along with a Silver medal in the 100m. Lachlan took out his first W.A Athletics state title in the 400m Hurdles, along with Silver and Bronze in the 100 & 200m. Imogen retained her 2018 SLSWA state title, again winning the Beach Sprint. She added a Silver medal to her collection, coming second in the Beach Flags. Imogen went on to place a very respectable 4th in her age category Beach Sprint, at this years aussies held in Queeensland. Well done to you all! Athlete of the Year Awards - 2018/2019 coming soon! ​Check out our Honour Board & Awards page to see our past winners. We are excited to announce and welcome our latest athlete to join the group, Australian winter olympian, Gareth Nicholls. A two time Australian Olympic team member. 2014 Sochi Olympic Bobsledder Gareth brings great sporting experience as a seasoned track sprinter, world beach sprint championship finalist and more recently club rugby player. Our Photo shoot promoted Blocks involvement with sporting clubs across the state. Touch Rugby, Hockey, Basketball, Beach Sprinting, Netball, Soccer, Cricket and Womens WAFL representatives all turned out on a wintery morning at the WA athletics stadium. We have been fortunate enough to have worked with; Curtin University, Curtin Guild, Palmyra Rugby Club, North Beach Primary School, Trigg SLSC and North Beach Junior Football club members with sprint training in recent months and years. Feel free to contact us to discuss how we can help your club, group or team become more efficient and faster athletes!